E-commerce carts are abandoned at a rate of nearly 70 percent, but Qubit can help online retailers counteract this challenge. For many consumers, online shopping is an increasing reality. Still, according to U.K.-based web research company Baymard Institute, online shopping carts are abandoned at an average rate of almost 67.91 percent. That means for every 100 potential customers, almost 68 leave without buying anything. This is precisely the problem former Google employees Graham Cooke, Emre Baran, Daniel Shellard and Ian McCaig set out to address when they started Qubit in 2010. According to McCaig, e-commerce is growing at a rate of 15 to 20 percent per year, but the industry is still riddled with inefficiencies. “Lots of e-commerce businesses are still serving the same website to all the different users,” he says. The goal at Qubit is to use data to help businesses understand consumer behavior to provide personalized experiences. McCaig says the company takes a unique approach to personalization and responsive design. Qubit integrates what McCaig referred to as “disparate data technologies” — including analytics, A/B testing and behavioral targeting — to enable marketers to identify user segments and how they behave. He used the example of a New York-based user who has made a previous purchase and likes to check out quickly. Indeed, Qubit prides itself on providing results to its customers. 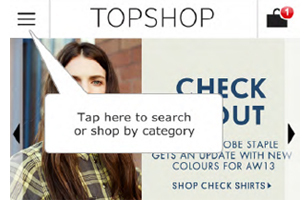 A recent case study showed a 10 percent increase in conversions for the British retailer Topshop after implementing Qubit technologies. Jimmy Choo, known for its handcrafted women’s shoes, uses Qubit to provide agile service and respond to user trends. Social shopping is becoming a bigger trend, according to McCaig, in terms of social networks driving more traffic. Users are increasingly social on e-commerce websites. He says the social shoppers tend to be very engaged with content and can become valuable brand advocates for retailers. “You don’t want to treat them with the same experience as someone who comes from a Google search,” he says. Qubit enables retailers to serve the social shopper with landing pages that encourage socialization and enhances their experience. McCaig says the result is improved conversion rates from social channels. By the same token, he says some retailers are starting to use customers as models by pulling images from their Instagram feeds. Others are starting to understand the importance of user reviews.